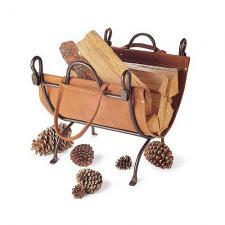 The elegant arches of this log holder, are accented by top-grade cowhide suede leather carrier. All seams are double sewn and riveted for strength. Measures 22" wide, 14" deep, and 20" high and folds for off-season storage.